Being that we have a 2 year old, there are always bananas in our house. Elias loves his “nanas”. However, he has the attention span of a gnat and I am often left with banana remnants that if not used quickly will go bad. I HATE wasting food. 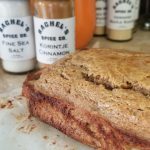 So I throw the banana shrapnel in a freezer bag and before you know it I have an abundance of frozen bananas perfect for this tasty quick bread! As you’ve probably guessed by now I am a Paleo kind of girl. Ever since I had my adorable little nugget I can’t eat dairy and that has pushed me to eliminate the other bad stuff as well. So you don’t find a whole lot of dairy, gluten, soy, corn, or white potato in our house. However, I am always playing with traditional recipes to make them paleo friendly and this one was a pretty easy fix! It tastes just as good as the regular version, even Dave and Elias eat it! 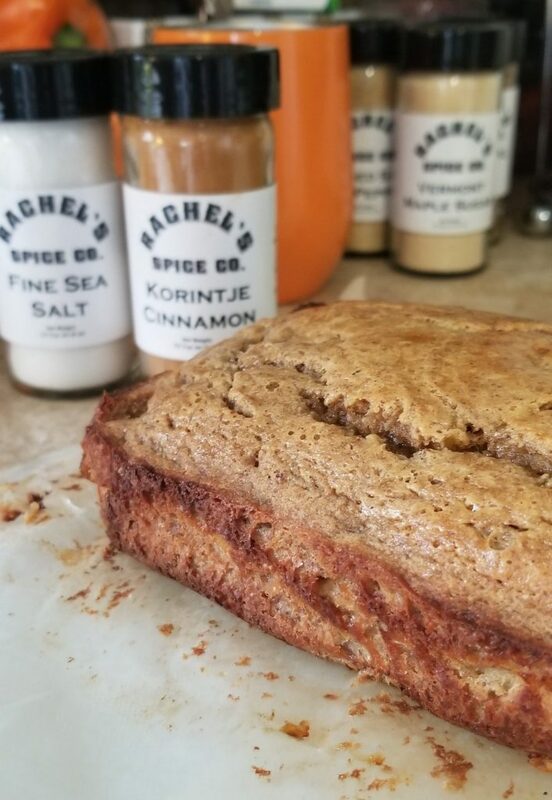 A banana bread that is free of gluten, dairy, hydrogenated oils, and refined sugar! Do not be fooled by its healthy appearance it is just as moist and delicious as the "bad" version! 2. In a small bowl combine the flour, baking powder, baking soda, salt, and cinnamon. Set aside. 4.Add to the coconut oil/almond butter mixture the mashed banana, maple syrup, and vanilla extract. Mix. 5. Add eggs and stir until smooth. 6. Add the small bowl of dry ingredients to the wet ingredients and mix until completely combined together. 7. If using, gently mix in the chocolate chips. 8. Pour the batter into the prepared pan (DO NOT FORGET TO GREASE) and baked 30 to 40 minutes until the top is set and slightly browned and a toothpick inserted in the center comes out clean. 9. Let cool in the pan for 5 minutes before gently removing the loaf from the pan to a wire rack to cool.